John Butler has produced the most comprehensive site guide to Doñana that has ever been written. 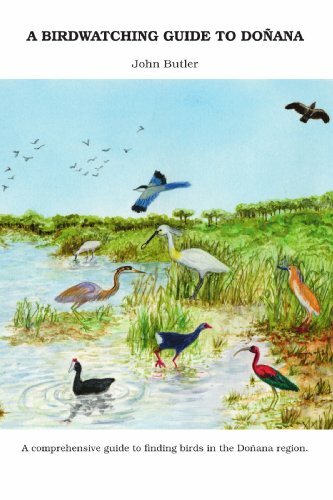 This book is an indispensible tool for all birders going to that region. John is an English professional bird tour guide with many years of birding and guiding experience, both in England and here in Southern Spain. Prior to arriving in Spain with his wife, Rebecca, he lived in Devon, where he spent 4 years in the British Army, 7 years as a publican and 20 years in the Prison Service. In 1996, he took early retirement and moved to Spain in January 1997. After two years he set up his own birding tour company in Estepona, on the Costa del Sol and whilst there he regularly appeared on a local English-speaking radio station, discussing birds and birding and answering phone-in questions from listeners. It was at this time that he write his first bird guide book Birdwatching on Spain's Southern Coast, which was published in December 2001. The book has proved to be a great sucess, selling thousands of copies and helping resident and holidaying birders alike to discover previously unknown sites. An updated second edition was publihed in August 2004. John and Rebecca moved to the Doñana region in April 2002 and they now live in Villamanrique de la Condesa, just a few kilometres from the National Park, where John's intimate knowledge of the area and birds has resulted in him becoming the best known and most active bird guide operating in Doñana and their birding tour company, Doñana Bird Tours, becomig the market leader for day tours and inclusive packaged birding holidays in this part of the country.